The Health Systems Management (HSM) major prepares nurses for leadership positions across the complex and dynamic health care continuum. The program emphasizes content from all nurse executive competency domains (AONE, 2011) including communication and relationship building, knowledge of the health care environment, leadership skills, professionalism, and business skills. Students build a systems-thinking approach to patient care, starting with clinical microsystems as a building block. The use of evidence to shape decisions is emphasized through coursework in nursing informatics, decision support, business planning, and outcomes and care transitions management. Graduates of the HSM program are prepared for a variety of nursing leadership roles including nurse manager, clinical microsystem leader, case manager, quality-improvement specialist and program or project manager. 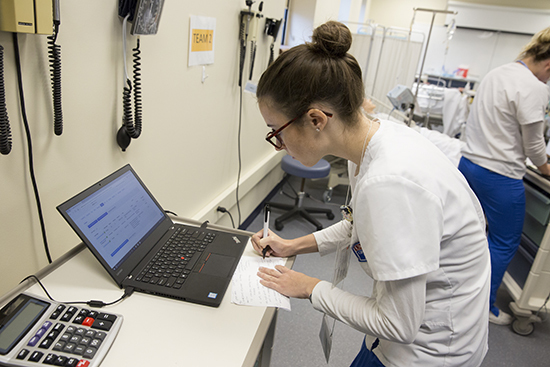 Coupled with appropriate experience, graduates may be prepared for advanced roles in nursing informatics, or as a nursing director or executive. Those with requisite experience may be eligible to seek certification in case management, nursing informatics, or as a nurse executive. The post-BSN to DNP with MSN exit with a major in HSM requires a total of 64 credits. A total of 39 credit hours and 268 internship and clinical hours are required for the MSN exit where the Master of Science in Nursing is conferred. An additional 25 credits and additional clinical hours are required for the completion of the DNP. The program is taught in an engaging online format that is flexible and student-centered. Students need not be a resident of Michigan to enroll in the program. Clinical sites and qualified preceptors are identified near the student’s home to complete the required internship/clinical hours. The McAuley School of Nursing is committed to flexibility in the program and therefore offers both full- and part-time options for degree completion. Full-time study can be completed in two years with some courses offered during the summer semester. Additionally, the program is offered online with course meetings scheduled in the evening to accommodate working adults. The master of science degree in nursing is conferred at the completion of the program requirements.